You might have your favorite and precious kimono or obi which are made of silk and wonder how to clean them. Cleaning kimono is very delicate matter even in Japan. Cleaning shops that specialize in washing kimono & obi (and other things relating to kimono) are required high quality techniques and expertise. Although it may be difficult to do in the same way as Japanese do, treat them basically as well as high-quality silk dress. * It’s not advisable to wash kimono or obi by yourself. It’s better to leave them to a reliable dry cleaning shop which can treat high-grade silk items. * Frequently cleaning kimono causes a damage the cloth. Usually, cleaning is enough once in a season or when it gets dirty. * When you get stains with blot, sebum, mud, water and the like on kimono or obi, leave it to a dry-cleaning shop to remove only such stains (no need to clean whole cloth) as soon as possible. * The cloth and threads of antique kimono may have waned. You had better tell it to the cleaning shop in advance. * After wearing kimono, brush it softly and shade-dry it. Apart from anything else, try not to smirch your kimono and obi first. 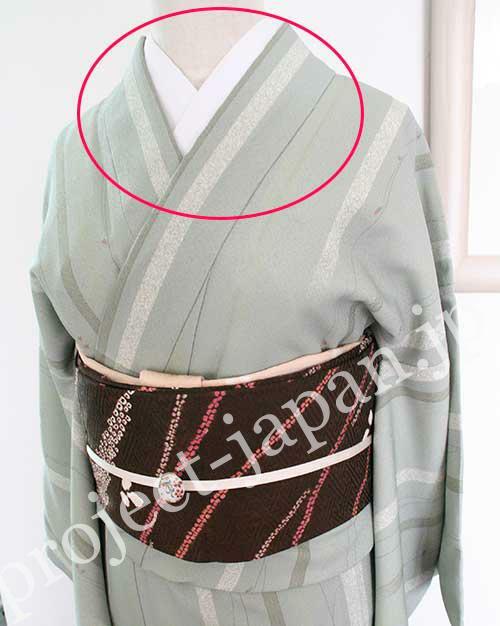 The collar of juban prevents kimono from adhering sweat and sebum or others (cosmetics etc.) to kimono. Sleeves and hem do as well. We put on juban in order to guard kimono from dirt around the neck, wrists and hem. And also it’s beneficial for dressing up. When wearing yukata, juban is not needed since yukata is casual kimono made of cotton or ramie (or hemp) and washable at home. We are often asked “Do you know a good kimono cleaning shop?” and “I want to get my kimono cleaned in Japan. What should I do?” from overseas. You also might have been desplayed your favorite kimono for years. If you think you want to send your kimono to Japan and get it cleaned, please feel free to contact us. *Whether it has been displayed in a showcase or exposed. *Especially in the latter case, there may be much dirt (including invisible dusts) adhering to it – not only its surface but also between fibers -, and they need to be removed. *As silk has a low tolerance to light (sunlight, UV, room light etc. ), the color might have changed partially. *If your kimono is an antique one, the cloth and threads might have deteriorated over time and it needs to be treated more carefully. In some cases, they advise you to wash, smooth and make (retail) it over again. We may be able to ask to reliable experts. Please note that in some cases, they couldn’t be able to accept items from overseas easily because most of them are not good at English and they won’t look over your kimono directly. In Japan, we show kimono which we want to make clean directly to experts first, and next, they look at it carefully. Then they show the essential processes and costs in a written estimate. So we can decide whether to go on the whole process or choose some points. When you ask us about your kimono cleaning, please tell us the condition and send us pictures. Such information will help us. If you have any question, feel free to ask us!